Data are age adjusted to U.S. 2000 standard population. 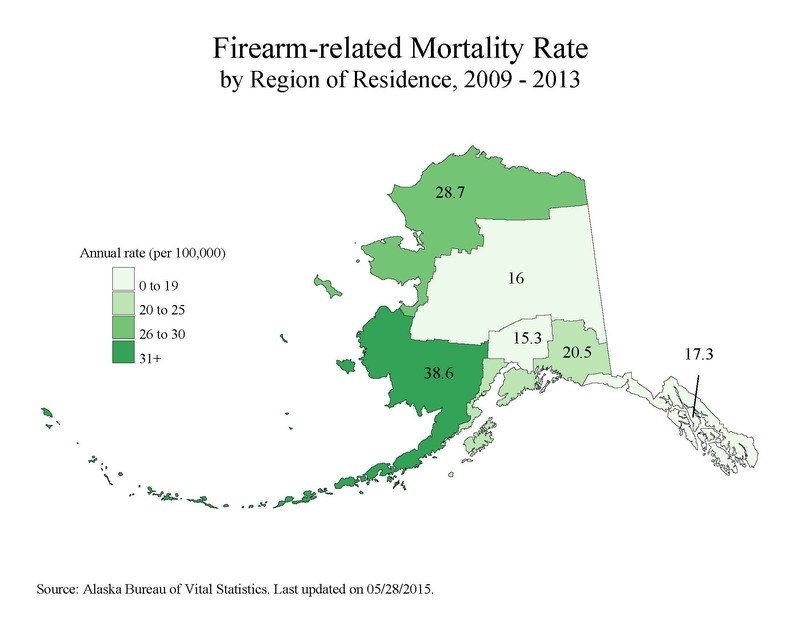 Source: Alaska Health Analytics & Vital Records. Last updated Jan 2017. Rates are age-adjusted for U.S. 2000 standard million population. Data are age adjusted to U.S. 2000 standard population. The interviewer began the firearm section of the survey by first informing the respondent that "the next three questions are about firearms. We are asking these in a health survey because of our interest in firearm-related injuries. Please include weapons such as pistols, shotguns, and rifles; but not BB guns, starter pistols, or guns that cannot fire. Include those kept in a garage, outdoor storage area, or motor vehicle." Presence of firearms in the home was assessed by asking the respondent, "Are any firearms kept in or around your home?" Firearm-storage patterns were derived from 2 questions: "Are any of these firearms now loaded?" and "Are any of these loaded firearms also unlocked? By 'unlocked' we mean you do not need a key or combination to get the gun or to fire it. We don't count a safety as a lock." The firearm module has not been asked on the Alaska BRFSS since 2007. The information provided above is from the Alaska Department of Health and Social Services' Center for Health Data and Statistics AK-IBIS web site (http://ibis.dhss.alaska.gov/). The information published on this website may be reproduced without permission. Please use the following citation: " Retrieved Sun, 21 April 2019 22:00:00 from Alaska Department of Health and Social Services, Center for Health Data and Statistics, Indicator-Based Information System for Public Health Web site: http://ibis.dhss.alaska.gov/ ".